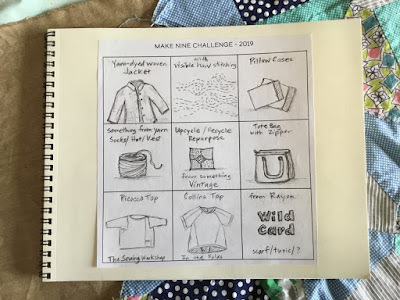 With the lingering exhilaration and motivation from participating in the 100 Days 100 Blocks Challenge in 2018, I'm excited about joining Rochelle and other makers for the Make Nine Challenge this year. Anyone else want to come along for a fun and creative making journey? (Beware—I'll be sending out personal invites to a few of my creative BFFs). 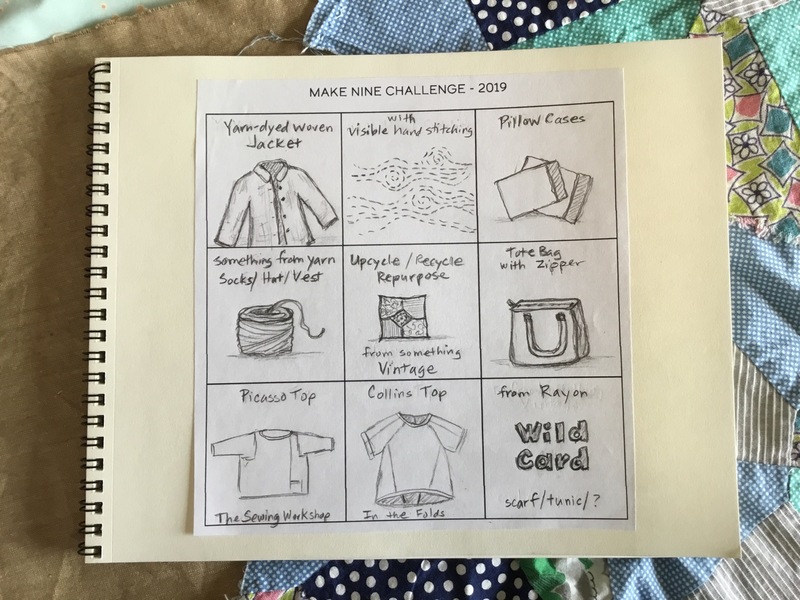 After reading details about the Challenge on the Make Nine Challenge website, one of the appealing things is embodied in the tagline on the Instagram image: "A gentle, self-guided slow fashion initiative for fabric and yarn lovers." The keywords for me were "gentle, self-guided." This makes it a better fit for my unpredictable schedule these days. 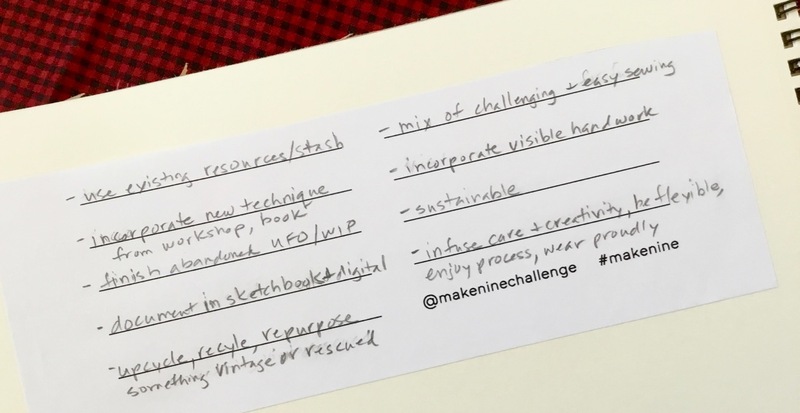 The inspiring Instagram posts (#makenine) showing how participants were documenting their 9 makes also got me intrigued. When I made up my mind to take the plunge, I thought it would be fun to go and buy a new sketchbook to document the adventure. (Much like shopping for school supplies at the beginning of a new school year.) With a personal goal to use materials I already have for upcoming projects, I re-thought a trip to the art supply store and found an 8" x 10" sketchbook I already had. Check. Be sure to download the free planning worksheet from the Lucky Lucille blog. It will help you organize your thoughts and give you a visual reference of your project choices. 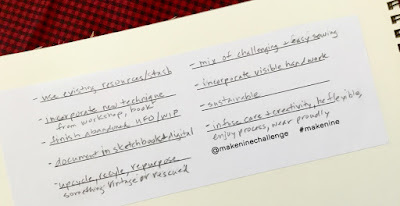 A gazillion potential projects immediately popped into my head, but I pared down my Make Nine to a "most-desired" list... and left a little flexibility in the list as well. Three patterns for Make Nine projects. 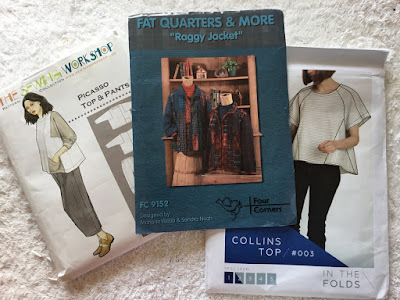 Picasso Top, Raggy Jacket, Collins Top. Jacket using Diamond Textiles yarn-dyed wovens. My go-to pattern is Raggy Jacket because I already have it fitted to me. 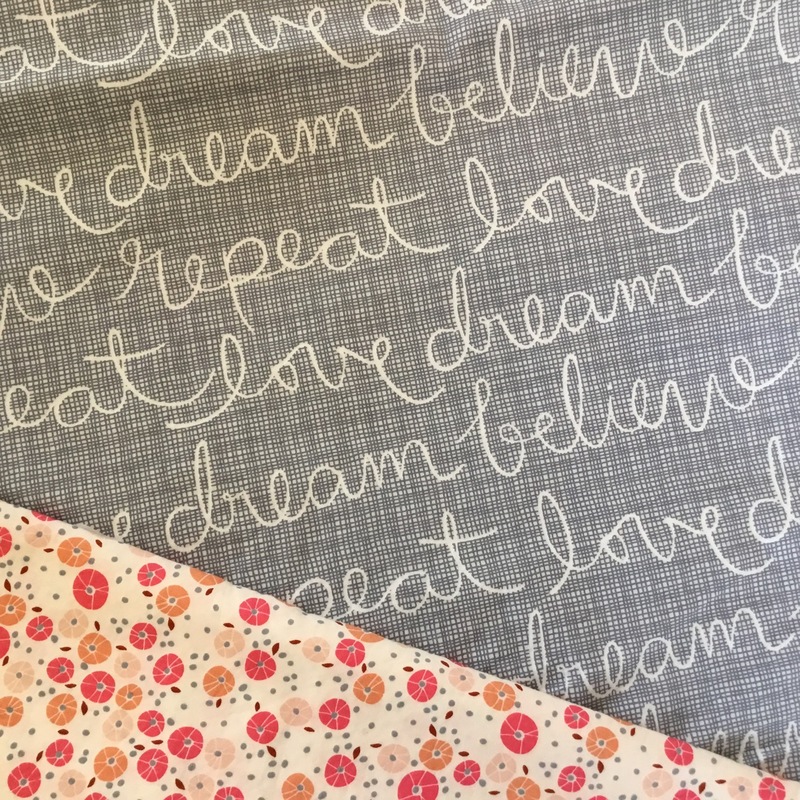 Here are fabrics for a few projects on my Make Nine list. I'm going to try mixing knits and wovens for a Picasso Top. 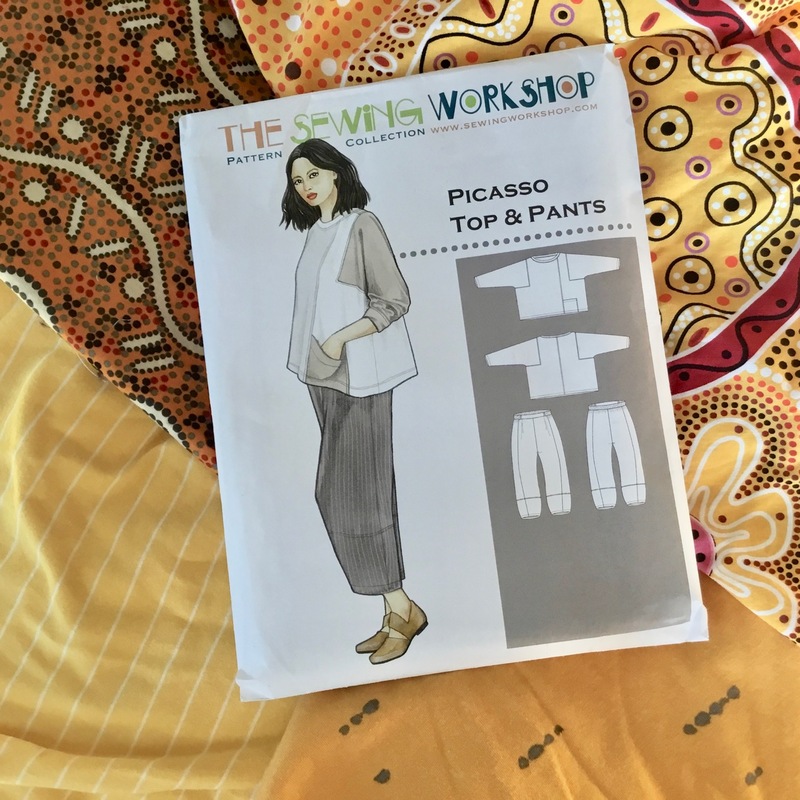 Fabrics for the Picasso Top. Knits from Art Gallery. Cotton wovens from M&S Textiles Australia. Fabrics for pillowcases (Art Gallery Fabrics). 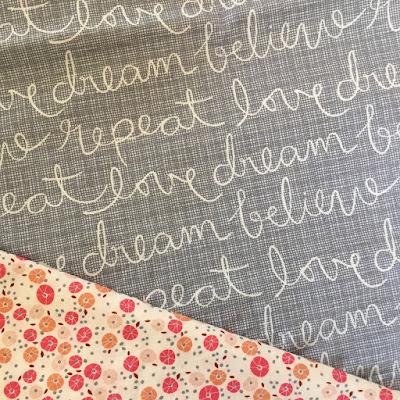 Vintage quilt blocks with a coordinating Art Gallery print from the Soulful collection and a gray yarn-dyed woven from Diamond Textiles. Vintage quilt blocks coordinated with new fabrics. I decided to write down goals and objectives for my Make Nine. 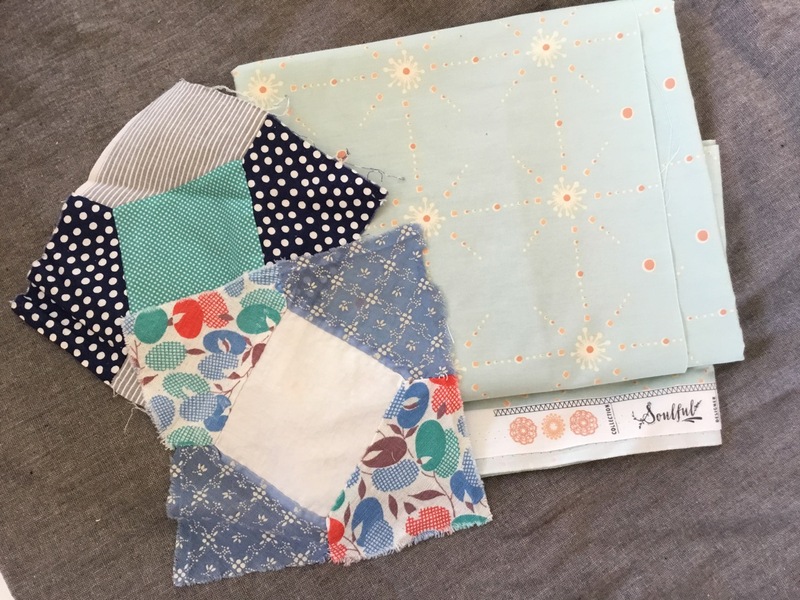 For projects not yet nailed down, this will guide choices for fabrics and materials. I've pasted these objectives and goals in my sketchbook. incorporate a new technique from a workshop, book, etc. With a plan in mind, I hope to make good progress in 2019 through this Challenge. I'm confident I'll be inspired and motivated by fellow participants. It's not too late to join! Make a list and share your progress and successes.